The first step is to establish a challenge. 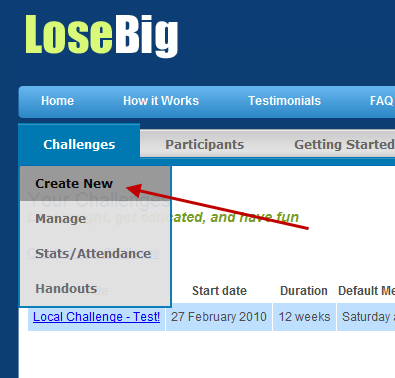 Place your mouse on the Challenge link above and select Create a New Challenge. Note carefully the beginning date of the challenge, as the handouts are automatically dated to coincide with the respective weekly meeting dates. Complete the short form and Save. Complete challenge information will be displayed on the next page. Once finished, verify the challenge information; especially make sure the address is correct, as the form will look up the address of your WLC using Google Maps and place a red “pin” at the correct location on your website. Some participants may use this map to determine their driving directions, so please double-check the location. To make changes, click on Edit in the lower left hand side of the page. Click on Handouts and check the dates. These will be automatically unlocked on the meeting dates; however, if you prefer to make the handouts available before the meeting dates, click on the link and make your selection. That’s it! 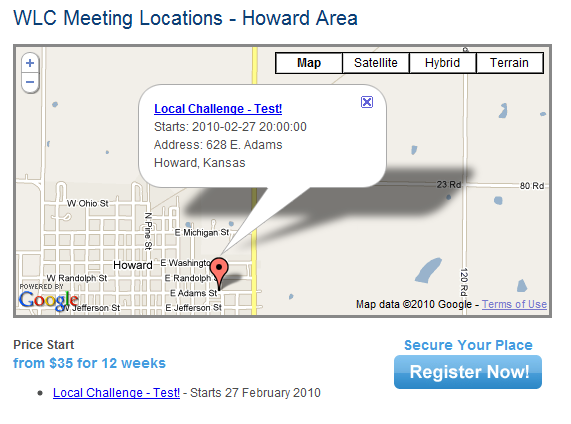 Now that your challenge is set up, you can begin inviting participants. Send them to your LoseBig web site to register; you will be notified via email when their registration is complete. Your participants’ information is found under the Participant tab.